P.P.S - GET YOUR MONEY BACK NEW YORK! OR REPEAL THIS INSULT. 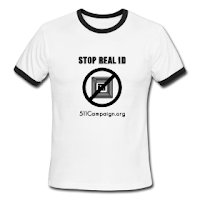 REAL ID DOESN'T WORK! "STATEN ISLAND, N.Y. -- The underground market teens use to get fake ID has taken a sophisticated, and frightening, turn. Online ID mills overseas now churn out fake licenses so convincing that homeland security officials have taken notice." BTC- What have we told you? What have we been saying for years? What did Ron Paul tell you? You entrench a systemic requirement for identity credentialling and someone is going to give you the end around and create a black market for identity. They railroad regular law abiding citizens into a ditched forced surrender of their liberties so they get left holding the bag. What a waste. 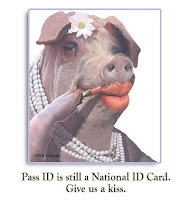 All those poor NYers having to go get their voluntary-compulsory national ID card. Just so they can walk around with convenient RIFD location dataveillance for Big Data trolls everywhere. It just goes to show you what a bunch of myopic, greedy buzzards can do for the public interest. Gov. Spitzer made sure NY was the early adopter. He probably got a nice reward from the CDSL, like Delaware. Their kids will be online getting copies of their tschocke laden plastic crap next. Good going, East Coast. Impressive. The makers of aluminum wallets thank you for sponsoring the market solution to your thoughtless pork project. Then the government will use this as an excuse to continue pushing NSTIC - the next tier in full spectrum identity dominance sponsored by Facebook/FBI and other jerk CISPA supporters. New York, do yourself a favor. If you respect your time and whatever's left of your privacy and personal freedom, if your not totally beaten down with no will left, PLEASE THINK about ways this costs you - time, trouble, energy etc. I know you had to take off work. You get harassed every single day, 10 times a day, at least, for your stupid proof of ID to get through the day. Maybe go visit Occupy Wall St and let them know your tired of paying for this fraudulent excuse to fleece you of your freedom in every interaction. Go to the City Council meeting and use your 2 minutes to tell the world how this bothers you. It's okay to push a little dirt at the system, because they don't really care what happens to you so long as they can manufacture your compliance and get your money. Don't pay. Let them fall into the hole. Don't pay for this crap. Get through their interaction. If you can't opt out and you don't drive, go get a passport. Whack the RFID in the passport and get on with your life. You don't owe these vampires another ounce. The Obama administration is grossly misreading international law when it comes to targeting terrorists.